President Shimon Peres praised Canada's long friendship with Israel as he conducts a series of working meetings with leaders there. "I thank you for your invitation to visit your special country," Peres said, speaking in French. "I carry with me Jerusalem's deep gratitude to Ottawa for the enduring friendship that you showed us as close kin in the family of nations." Later, Peres said, "I visited Canada for the first time 60 years ago in search of a means to defend our country, and for friendship, and to open the doors of peace. I found these here, in Canada." "Ever since, I have carried in my heart the feeling that Canada is land which is friendly, supporting, and caring towards Israel. I have never felt Canada is indifferent," he explained. 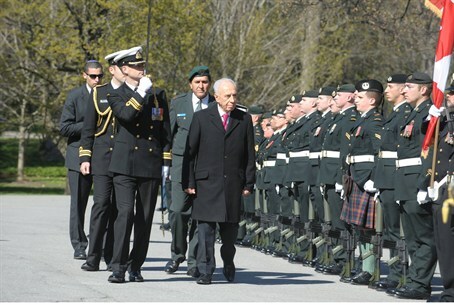 Peres added, "A visit to Canada is an opportunity to strengthen a very special relationship. Relations between countries are important and promising, as well as our commitment to ensure we live in days of peace, prosperity and growth." As Governor-General in Canada, Johnston fills a role as Ottawa’s federal vice regal representative of Canada's monarch, Queen Elizabeth II. Johnston was appointed by Prime Minister Stephen Harper with Queen Elizabeth II's consent. Prime Minister Stephen Harper's government has been highly supportive of Israel in the international arena.